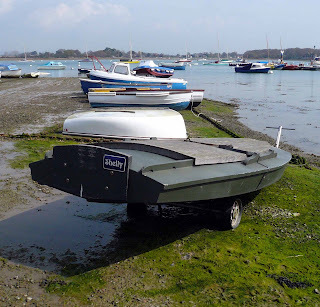 Having written just a few posts ago that I had never seen a duck punt in Chichester Harbour I came across this one on a trailer at Itchenor. It doesn't seem to have the fittings for a duck gun (the monster cannon used to fire a cone of shot into a rising flock of duck, because you only get one chance) so I suppose the wildfowlers must use shotguns. 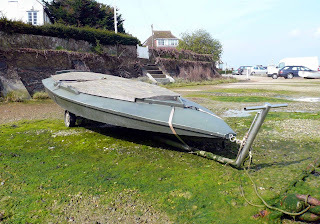 In addition, an outboard mount seems to have been added to the transom, and outboards are illegal when puntgunning. Are you sure that's a true punt? Looks very similar to a Fireball racing dinghy. I do have a couple of punts and have seen many more, but never one of that shape. I know there is much regional variation, but this is usually quite subtle - a square transom would be most odd. I would expect this is a 'fowler thinking laterally and using the above dinghy as a punt. Additionally there is no mount for a gun, so this is being used as a platform to shoot shoulder guns from not the big gun.